SCOTT TOLLEY: Thank you very much. I won’t do my best Julius Mason, but just want to thank you for being here. There have been a number of media requests over the last month or so for Jack’s time, and so we thought, why not bring him out here on Sunday of The Honda Classic, played on the Jack Nicklaus redesigned Champion Course. So thanks for being here. And, Jack Nicklaus. JACK NICKLAUS: I’m here. We’re going to do a little television, and [it] looks like you’ve had a pretty good week of weather, a little windy to start off the week. And this course is not an easy golf course with the wind, as you all know. So I guess [it’s] a lot better than it was last year. Last year you didn’t have a very good week of weather, did you, as I recall. JACK NICKLAUS: Monday finish last year? Well, okay. Anyway, I haven’t been out here for awhile and I’m out here today to have a little conversation with you all, and then a little conversation with Johnny and Dan. Q. Gil Hanse redid Doral a couple years ago and since then he told us a month or so ago, he’s gone in each of last two years and done little tweaks to continue to make it better. You’ve redone the 14th green here a couple of years ago. Do you have anything else in mind or do you feel like the course is good? JACK NICKLAUS: Well, I don’t really have much in mind. Every so often, we have been asked by the owner, they said they are going to redo the greens or redo the fairways or redo this, and they said, is there anything you would like to review, like, see how it’s playing for the tournament and how it’s playing for the resort. I know it’s a strong golf course for the resort. We review it and if there’s things, cut it down to a par 70 by taking 6 and 10, and making those par 4s. When we did that, we opened up the tee shot on 6, because it felt like it just got a little too narrow down there on the right side. And so we took the little pot bunker out in front of the green. There’s things we’ve done to actually make the course a little easier, but we also have done some things that probably have made the course more difficult through time. I don’t know, I guess they have added… not even playing the back tee we added at 18. They don’t even play it. The new tee at 17 a while back, and of course we did the 16th green or 14th green a year ago, I guess they played. All that was, it was a situation where when we did the hole, I felt like we were too close to the out of bounds but also we were in a narrow spot there. We also kept it away from the water, and the reason we kept it away from the water was because of 15, 16, 17, 18. We just decided that we needed a place for the gallery, we needed places to keep them and not put the out of bounds in play. So I brought the green over to the water, but sort of to the water–really kept it away from the water from the entrance to get into the green, but at least you’ve got some space left of the hole. Did that. I don’t think there’s too much else we’ve done to the golf course over time. Little tiny tweaks, but yeah, I think there was a little bit at 3 we did, reduced that bunker left. Took the little pot bunker out in front of the first green and wrapped the bunker around a little bit. But they are just little things. There’s just not that much, they are not that big a deal. But I think it’s a nice golf course. It’s a pretty darned good test of golf. Do I have any more? We’ll find out the next time we want to do some grassing. Q. 30 years coming up, just what are the memories that stand out most of that week? JACK NICKLAUS: Of what? [laughter] 30 years, you want me to remember back? You talking about the Masters, I assume? This is actually 45 years today I won the PGA here. That’s longer, but that was across the street. [Laughter] Oh, I don’t remember much from it. Could be 29 years or 31 years. It’s 30 years ago. I mean, what do you want me to tell ya? Q. Does anything stand out, anything more as time has passed on? JACK NICKLAUS: They stand out much less, I promise you [laughter]. I’m not going to waste everybody’s time with that. I think we’re going to do… I think the Golf Channel is going to do a special on the ’86 Masters. Seems like we just did the one from the 25th year yesterday but it was five years ago. Could talk forever about it but I don’t think this is the time and place. Q. I’m getting ready to have you go even further back in time. Your recollections about when the big three came about and when you hear these three today being referred to as that? JACK NICKLAUS: How the big three came about? I think the big three came about primarily because of Mark McCormack. McCormack managed Palmer and then he managed Player and then he managed me. We were the ones that were winning most of the tournaments, and of course the first World Series was played in 1962. Arnold won two of the majors and then Gary and I each won a major. So that was how it got there. And pretty much my guess is–I don’t even remember–McCormack probably started talking about it, he got some of his press friends to talk about the big three and that’s how it came about. Today you’ve got three guys, which three you talking about, Rory and Jordan? They have got more guys than that today. Jason, I assume. You’ve got a lot of good players. I think the game has gone through several cycles. Prior to when I played, there really wasn’t a lot of guys playing much until Gary came along and then I came along and Trevino, Miller, Weiskopf, Watson, etc., had some pretty decent players as we went on. Then I think you had a little bit of a drop after that. I think Tiger had a little bit of the same thing that Arnold did. Didn’t have the name recognition of competition that we had. Don’t take anything away from his play. He played pretty well, as did Arnold. Then all of a sudden now you’ve gotten, first you’ve got Rory and then you had Phil and Vijay and Ernie, then you had Rory come along and then now you’ve got Jordan and Jason. And you’ve got— One that I think is going to be a really good player who missed the cut this week is Patrick Rodgers. Of course I think Justin Thomas is going to be a really nice player. I think he already is a really nice player. You’ve got several other young kids that have an opportunity. Tony Finau has a tremendous amount of ability, I don’t know when it’s going to happen or when it’s going to get there but he’s got a lot of ability. I suppose I could keep going if you gave me a list on a piece of paper. I think you’ve got more good players right now than you’ve had in a while, and I think that’s only really good for the game of golf. I don’t think there’s any question about that. You know, back when you talked about the Big Three, it was like if the three of us didn’t show up, they felt like they didn’t have a tournament. Well, that was kind of silly, just like it is today. If Rory didn’t show up or Jordan didn’t show up, they think you don’t have a tournament. You have a lot of good players to have a great tournament. Did that answer your question, sort of? JACK NICKLAUS: Has there been a lot of guys in them? Have guys been hitting balls over there to have a sandwich or what? [Laughter] If you’re not playing, you don’t know, it’s pretty hard to answer your question. I think that you’ve had probably a tremendous gallery response this week, as I’ve understood. I think that’s great. We used to have tournaments in the Palm Beach area and they weren’t successful because you couldn’t draw a crowd. Now you draw a tremendous crowd. I think it’s been terrific what’s happened out here. I think the golf course has obviously helped that. I think the condition– The Honda people have done a really nice job. I think Ken Kennerly has done a really nice job. And I think the ideas of bringing in what he’s done at 17 and other places, 18 and so forth, has brought to a lot of people some convenience, some excitement, some places to watch the game that they wouldn’t have had before, and some other things to do with it. So the game, you think about the game today, and outside of the major championships, it’s really– well, even the major championships, it’s a form of entertainment. It’s all theatre and how can you give it the best show you can get for the people, and I think that’s what a lot of it is about. You do see a lot of good golf but a lot of it is a show. I think the Phoenix people started that more than anybody. SCOTT TOLLEY: Just a quick note on that, 2010 to last year, they set an attendance record every year and despite the weather last year, they came 27,000 shy of matching the record before. So I think they are just right under 200,000. Q. You didn’t even read off a sheet of paper. SCOTT TOLLEY: I didn’t. Nine straight years of record charitable giving. Q. We know you had Davis and all the American possible/probable Ryder Cup players around on Thursday night. How much do you enjoy that and how much do you think that will help in terms of building the team spirit? JACK NICKLAUS: I don’t know, I can’t imagine how them coming over to have dinner at an old man’s house is going to help any[(laughter]. And he said, “I don’t know, somewhere between 30 and 60.” Oh, okay, just a little small party. But anyway, I think we had 29 players, 29 people there, something like that. Anyway, it was a very nice dinner. It was attended by Davis, his three assistant captains, which of course is Tiger and Jim Furyk and Tom Lehman, most of the fellas who will probably contend for The Ryder Cup Team. There were some that weren’t there. But what the dinner was about was, I think, more getting the guys together, trying to get a little bit of bonding, trying to have them pick my brain a little bit about being a past captain and past player, trying to build a little enthusiasm within the group, and I think the guys were very pleased with that. So it was a very nice evening. My wife gave them too much food [laughter] and probably too much wine, probably, also. But the wine was terrific. It was mine. [Laughter] And too much of my ice cream, which was really good, too. These are my commercials. SCOTT TOLLEY: Now available in Publix stores in southeast Florida. JACK NICKLAUS: But I think they had a nice evening. I think hopefully we didn’t get them home too early. I know Rickie wasn’t affected adversely. He shot, what, 66 again the next day. Didn’t bother him. I thought it was a very nice evening, and Davis asked me if we could do something similar at Muirfield when we are at The Memorial, so I said sure, be happy to. Q. You’ve talked many times about how special it was to have Jackie caddie for you at that ’86 Masters. Do you recall how that came about that he worked for you that week, and can you talk to how much he might have helped you? JACK NICKLAUS: I don’t really remember. I’m trying to think, who caddied for me the previous year, probably Angelo caddied for me the year before, maybe not, I don’t know. That was about the time when– I think that was the time that Angelo and I parted. It was kind of a funny story. Angelo had was caddying for me at Pinehurst, and we got to the fourth hole, par 5, and I asked him where the pin was. He said the pin was in the back and hit it in the back of the green and the pin was in the front. Of course Angelo and I were friends for years after that, but you get all my golf courses, did all the yardages for all my courses and all that kind of stuff. I think that was probably the year before. So it was like I didn’t really have a caddie, and the kids had caddied for me a little bit before. Steve caddied for me when I won at Colonial in ’82. Jackie caddied for me at Muirfield when I won in ’84 and Jackie caddied for me in ’76 when Jimmy pulled his Achilles at Birkdale where Johnny won. So I think I just started… I wasn’t playing that much. I said to the kids, would you like to caddie. And so they started splitting it up. Jackie took… I think Jackie took the Masters, and I think he had the Open, and Steve had the British Open and the PGA, I think. So that’s what they did. And so he just happened to be on the bag. He was going to caddie for me one way or the other, but it just happened because of the situation that happened before, and it was really neat to have him on the bag because he loved playing the golf course. He had obviously been around it a million times. But as it relates, I always look at a caddie… These guys [today]look at caddies a little different than I did. They rely a little bit more than I did. I never relied on a caddie for anything. I always relied on my caddie to be there, be on time; have the three “ups” of caddying: Show up, keep up and shut up, the ups of caddying. I never had anybody really get into me on caddying. Although there’s still only two guys I ever ask anything about on a green, was Jackie and Steve. Both were good putters. They weren’t going to give me any more than they thought, and so I would confirm a lot of times with them. So that part was fine. They both had… They both did yardage fine, and so forth and so on. It was not a big transition, but to have him on the bag when you won your last major, yeah, that’s pretty special, there’s no question about that. And of course to have my mother and my sister there for the first time since 1959 was also very special. Why they picked the ’86 Masters to go back, I don’t know. That answers some of your questions, Craig. It was just nice to have your son on it and share with you. JACK NICKLAUS: I might have said that. [laughter] He did say that to me every putt. He knows that my biggest fault is always to move my head when I putted. I always wanted to; it’s just something the average golfer does and I do it, too. I always pop my head up. So he just said, okay, okay dad, knock it in there, just keep your head still. That’s basically it. Just a nice little reminder. I probably only moved my head half the time. [laughter]. Q. A few years ago here, I think you said you like the short holes, that a well-designed short hole can be as good a test for these players as a long hole. When you saw the range of scores on 15 this week, but yesterday in particular, did you feel like that validated your thinking? JACK NICKLAUS: I haven’t seen the scores on it, but I did see Adam Scott had a little trouble with it yesterday. You know, I never dreamed that these holes were going to play that difficult coming down the stretch. 15, prior to us doing was just a little par 3, had water, but it was ten yards off the green and not that much in play. I just sort of, yeah, I think it needs didn’t change the hole much. Basically just put a bulkhead around the green. But that wind comes through and comes through at an odd angle around these trees and so forth. And if you’re playing right to left you’re going to put in in the right bunker; and if you cut it left to right, you’d better have enough on it or you’re not going to get it there. So that hole plays very tricky. I don’t think 16 is all that tricky. You need to put the ball in the fairway off the tee, and I don’t think the second shot is all that difficult. If they ever changed it again, I would probably take 16 and pull it over water if we did it again. If you’re going to have a Bear Trap, you may as well be a nice trap, because 16 is really a hole that got included in the Bear Trap, but is in between 15 and 17 which are both really strong, neat little par 3s. 17 plays with this wind, it’s not playing that difficult this week. But when the wind turns around the other way, it can bounce off those buildings and get swirling and it can play very difficult. I think they play it just a little bit longer than I wanted to see it play. They added another tee to it, which was not my druthers, because I felt like it was tough enough when the wind was blowing without having to go back, and I think they got it back close to 180 yard or 179 or something like that. Q. Augusta National is looking at acquiring some land, more land from Augusta Country Club to do some things around 12 and 13, possibly even actually making 13 longer. What do you think about making 13 longer? JACK NICKLAUS: Well, they already made it longer once, Alex. They bought a little bit of land from Augusta Country Club. The tee shot at 13 would be helped by a little bit of length. Yeah, I think it would be. I don’t think there’s any question about that. Guys now take it over the top of everything or take a 3 wood even over the top of everything. I used to be able to do that, too, but the trees were about half the size. But I think that’s the… The tee shot is really dangerous and it needs to be hit well. I think with the length the guys hit the ball today, it’s a little easier than it needs to be. It’s not really a par 5 the way it is. It is but it isn’t. And I would think a little length would not hurt that. I hope they don’t decide to take the 12th green and move it back with it. Q. It’s just with the land area they would acquire would be back there, but they are not going to touch 12 I don’t think, just 13. JACK NICKLAUS: Augusta, they have done a really good job of changing the golf course to suit the times. I think they have done a better job than anybody. They can well afford that, though, but not many people can. I think most of the holes sit in there nicely. If they want to change 12, they have 50 yards behind it if they wanted to, but they certainly don’t need it. It sits in there very nicely. Q. Just to confirm, 25 yards is enough on something like that if they wanted to extend it? JACK NICKLAUS: I think so. If the guys hit the ball over the trees, and there’s probably a half a dozen of them that can, and they only got certain conditions they can do it in. And I don’t think many guys hit driver there, anyway. They play 3 wood and 5 or 6 iron, and basically… Well, the 10th hole is longer than the 13th hole. I’m sure 11 is longer. 10 and 11 are both longer than 13. 13 is only 465. Q. Off the back tee. JACK NICKLAUS: Really? Where do they measure, 50 yards out to the right? It used to be 465. It was 465 when I was playing it. Q. It’s 510 on the card. From 485 to 510. JACK NICKLAUS: It was 465. Q. 465, 485 and then 510? JACK NICKLAUS: Thank you, because I do remember it was 465 at one time in time, one period of time. But anyway, and No. 10 was 485. 10 was 20 yards longer at one point in time. And the course was probably either 6,780 or 6,870, I can’t remember what it was, most of that time. And now, what, 7,300 yards, something like that? I think that hole would be helped by distance, yes. There’s not many that would be. I don’t think 2 will be helped that much. Well, I guess they bought Berckmans Road back there, did they, and opened that up? Space behind 5. Q. They are looking at it. JACK NICKLAUS: Looking at it? Maybe they have another road behind Berckmans. JACK NICKLAUS: Do you remember that? Q. Of course. I remember all of it. JACK NICKLAUS: You were there in ’66. Q. And you only used your driver 17 times at the British Open. So wondering about your growth as a golfer that year, in particular. JACK NICKLAUS: I mean, I don’t know what my growth in golf was. I was just playing golf. Never really thought much about it until you look back 50 years later and you ask a question about it. Well, you’re hitting flyer after flyer after flyer after flyer, where the year before, you had nothing but spin the ball beautifully. Anyway, it was his golf course. It was his way of saying… Winning score was 17 shots higher, it was obvious what they had did. They did it because I had shot 271 the year before and they weren’t going though have that again, at least not for a while. I actually played pretty well, but the golf course was really tough. Then we got to the British Open at Muirfield and I looked at the golf course, and that was a golf course. It was exactly knee-high rough right off edge of the fairway. There was no semi anything. It was hysterical. You’d go in there and you’d hit a ball in the rough and you’d put your bag down and start looking, and then you couldn’t find your bag. [laughter] And if you had a short caddie, you’d lose him, too. It was difficult. So it was just not only did you not want to be there because you weren’t going to find your golf ball, but you just had to stay out of it. I just made up my mind that I was going to play the golf course a different way, and I played it with a lot of 1 irons and of course we’re playing the small ball and of course the golf course is not particularly long. Didn’t play long because of the small ball. And I used the 17th driver on the 14th hole of the last round and hit it in the bunker and made bogey which almost cost me the tournament. I should have hit 16 drivers. I hit 3 wood the previous three rounds. But yeah, any time you finally do what you’ve been trying to do at the British Open, in other words, I finished second in ’63, I gave it away, bogeying the last two holes. ’64, I finished second to Lima. Then we played Birkdale and I never did play Birkdale particularly well. I think I finished 13th or something. I guess one time I finish the outside of the top three for 17 years or something. Then the next year I came back to Muirfield and I loved Muirfield. I remember Muirfield from playing The Ryder Cup Matches and all week we had a west wind, and Sunday we had an east wind. And the Walker Cup, when we played there, we had an east wind the whole time. So I knew the golf course with an east wind, and not many of the other guys had ever seen it with an east wind. So that made a lot of difference in playing that first round. But yeah, to win all four majors, to have done that at age 26 was okay, pretty good. But you know, it’s just being able to finish properly in a British Open was what was very special. Q. You had all the rising stars of the TOUR out at the house, a lot of them haven’t played in a Ryder Cup. Wonder if you can give a thought about or a memory or two about your first Ryder Cup as a player, maybe who some of the veterans were on the team, and just what that experience was like. JACK NICKLAUS: Well, my first Ryder Cup was 1969. It was my eighth year as a pro. Then you had to be a member of the PGA to play in The Ryder Cup, which meant that you had to play five years on the TOUR, 25 tournaments, or four years and go to the school that they had. So I played four years and went to the school. So when I became a member of the PGA, I had a year to make a two year team and I didn’t… Or in ’67, I had less than a year to make a two-year team and I did not make it in ’67. And then I made a team in ’69. But it’s not that way today. I mean, if you come out of high school, you can make The Ryder Cup Team now if you play well. (Laughter). And I think if you’re a golf professional and you can play, if you’re good enough to make your country’s team, then you ought to play. I think being a member of the PGA was kind of silly. But that was the rules. Our rules, not their rules. They put guys right out… Tony Jacklin was a young kid when he started playing. Sam was a captain of that team. Who was on the team? I don’t remember. I really don’t remember. I’m sure Arnold had to be on it. Let’s see, I don’t remember… Dan Sikes. JACK NICKLAUS: No, Trevino, I don’t think Trevino was eligible. He might have been. I don’t remember. You know, I don’t remember who was on the team. But I do remember we had a tough match. I remember playing, obviously I played Jacklin the last two rounds. We played two rounds of singles on the last day. So I came home, and I always worried about losing weight, whether it would affect my play, my distance, things that I would do. But I said, I didn’t want to be tired, either. So I came home and I went on the Weight Watchers diet and I went on it for… I remember I called Hart Schaffner and Marx first day I started, I asked and if they could have a tailor down in three weeks, that I was going to lose 20 pounds. I said, if you [can] have somebody down, because I’ll need all new clothes. Hart was the company I was working with at the time. And when I did those three weeks, I did the Weight Watchers diet, and I went and I would put my clothes or my shorts on, or my bermuda shorts, whatever they were, and I would carry four or five clubs, and I would go run around the golf course as I played. Sure enough, I lost—at the end of the three weeks, I lost 15 pounds and I lost the next five the next week. First tournament I went out to was Silverado where they are playing Johnny Miller’s tournament… It’s going to be Safeway, Fry’s is done, isn’t it? I played that tournament, and I won that tournament. That didn’t hurt too much. I went to Las Vegas and won that tournament and went to Hawai’i the next week and started with 263 but ended up losing by a shot. I said, losing weight didn’t hurt too bad, and that was fine. Now get me one I can do now. [laughter] I’m not that heavy but I’m still 20 pounds heavier than I need to be. Q. For lack of a better word, how would you describe your curiosity as to where Tiger goes from here, and if you’ve spoken to him? JACK NICKLAUS: First time I’ve spoken to Tiger was the other night at dinner. He talked a lot. There was an article written about Tiger and what he [said was], he was feeling good and he told that to everybody. He says he was feeling good and he was feeling great, and he was able to stand over a putt and chip now without having any leg pain and so forth. We didn’t really talk a whole lot about it. Wished him well. We talked a little bit about— he never said— he doesn’t have a timetable for returning or anything else. He’s pretty private about what his situation is and I don’t blame him, because every time he opens his mouth, there’s nothing but articles written about speculation about Tiger. And I don’t want to break his— He likes it when we talk, we talk about different things. So I think that’s fine. But he looked very good. He looked very healthy. And he really misses playing. So that’s good. JACK NICKLAUS: No, I didn’t break anything. I just don’t think it’s my place to expound on Tiger’s health and so forth. JACK NICKLAUS: Sure, he’s 40 years old. I did pretty well when I was 40. Q. Curious if you had a curiosity where it goes from here, you personally as a golf fan. JACK NICKLAUS: I’ve told Tiger many times and I told him again the other night, I said, you know, Tiger, you know—and you and I have talked about it—nobody wants their records to be broken, but I don’t want you not to have the ability to have that opportunity to do so by your health. So I wish you well and I hope you get healthy, hope you get to play, hope you get out there as soon as you feel like you can play, and I hope you do well. Basically that’s what I had with Tiger. JACK NICKLAUS: I didn’t tell him that at all. I had a lot of people comment to me. I gave Barbara credit for 15, that’s just one more than Tiger. People have come back to me and said, did you do that on purpose? I said, no, I didn’t do that on purpose. People think I did. No, he looked great and he was in great spirits. The guys enjoyed having him at the dinner. We had a lot of nice back-and-forth about how to play golf and this and that and so forth. It was a very, very nice evening. I think that— I hope the guys enjoyed it. I hope they enjoyed— because I talked a little bit about preparation and I talked about how I played and what I tried to do and how I tried to do things, and how I tried to prepare myself for events, and how I handled The Ryder Cup and Presidents Cup, and things that we did. And they ask questions about that and so forth. That’s what we did. I hope it put some nice thoughts to the guys. Q. Curious how many players seek you out for conversation or advice, and do you ever find yourself kind of intrigued by the question they ask you? JACK NICKLAUS: I am intrigued sometimes. I’ve had a lot of guys come to me. Most of them are afraid to approach me. And I really— I’m very flattered by it. They have got all these young guys want to listen to something an old man has to say. It’s very flattering and it’s also very nice that they want to do that. I’m happy to give my time to any one of them who wants to talk to me and sit down, and I’m happy to do that. Do I have a lot of them? I probably have had a dozen or so that have come to me, and we’ll have lunch or we’ll just talk or this and that. Sometimes it may be a few words. I get a lot of credit from Jordan; I didn’t have a lot of conversation with Jordan. We had a few little things we talked back and forth, he asked me a couple questions, basically, but Jordan, I spent five to ten minutes, max. Rory, I’ve spent quite a bit of time with and talking with him. If they can get something out of it, then I’m happy, if that helps. Q. With Jordan coming up to defend at the Masters, [I’m] curious what you thought of him over the last couple years. What strikes you about him? JACK NICKLAUS: Very mature. Very savvy about how to play golf. And what Jordan does, which I really admire, because it’s a lot what I tried to do, I always got something pretty good out of my game when I wasn’t playing well. And Jordan doesn’t look like he’s spectacular all the time, but he certainly manages his game very, very well for a young guy. He doesn’t seem to, except what did he do last week, he didn’t play very well I guess, but everybody has a bad week. But I think he’s a very savvy, smart, calm, collected kid who thinks his way well around the golf course, who is not the most spectacular striker of the golf ball or anything else, but a very, very good, solid— He’s got a very solid golf swing. He has a very uncomplicated golf swing. He’s got a great short game, which is fantastic. He chips the ball fantastically, and of course, for some reason, oddly enough, his worst putting comes from about two to six feet. He’s a fantastic middle-length putter. Makes a ton of those putts. But I just like him as a kid, too. I like him as a person. I think he’s–how old is Jordan now, 22? He’s well beyond that in maturity, the way he handles himself. I think the way he’s handled his sister has been a tremendous thing, not only for his sister, but for him, because he’s grown up with things that have not been perfect and he’s handled them very well. So I give him a tremendous amount of credit. Like the kid a lot. Q. Speaking of Jordan, he has yet to play here, and a couple years ago, Arnold made a point with Rory where he basically demanded he come to Bay Hill, and he did. Is there any thought in your mind that you might reach out to Jordan? JACK NICKLAUS: I’ve never asked a player to play any place in all the years I’ve had the Memorial Tournament or been involved here. People say, gee, I hope I can be there. We say, we hope you can, too. I’ve always felt like when I played, I didn’t want people bugging me about playing. If I could try to get there and play, I would. I can’t play every place. I tried to always play one or two tournaments each year that I had not played on a regular basis to try to add into what I thought I needed in my schedule to prepare myself for the majors and the things that I was doing. And my guess is that Jordan will come here eventually. He’s only 22, for crying out loud. I think he’s going to find that this is a really good golf course for him. This is a golf course that requires a little short game, and he’s got a good one, so my guess is when he comes, he’ll do very, very well here. But I think he’ll come eventually. And he might come to me and ask me. Might not. I don’t know what he plays. How many does he play? Q. 25—a lot. He plays Tampa. 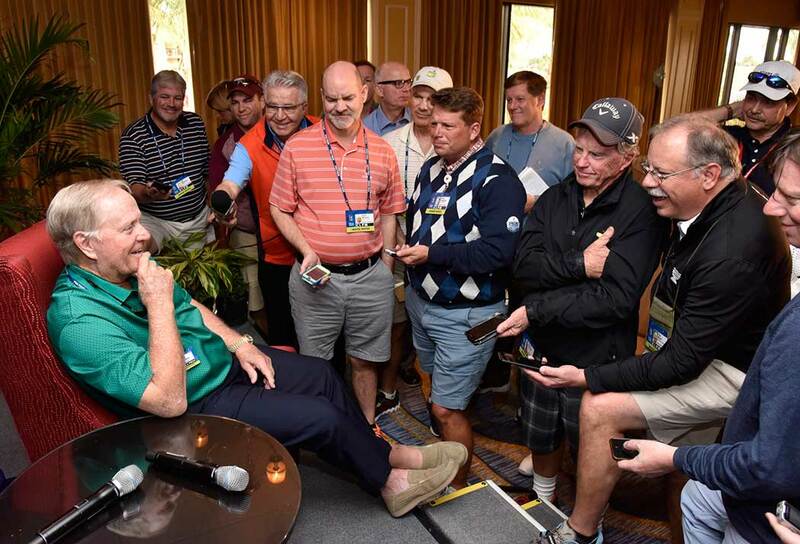 JACK NICKLAUS: No, no, I’m talking about number of tournaments. 25, 26? See, that’s a lot of tournaments. My first four years, to be a member of the PGA, we had to play 25 a year [laughter]. It was different rules then, different game. I always thought that was a little too much golf to play, for me. So I like to play right around 20 to 22 tournaments. It gives me enough time off, breaks to be able to, and I always try to make myself build myself for an event, particularly a major and let myself drop and let myself build up again and let myself drop. And you needed a little bit of space in there. You can’t play every week if you’re going to do that. Of course we had the falls off anyway. By the time we got to October, we were done playing. And so I ended up playing my 20 to 22 tournaments from January to October 1 and we didn’t have. I didn’t use October, November, December. I loved that three months of doing no golf. Had football games, fishing, other things I did with my kids, and I really welcomed that time. Barbara was really good on television yesterday. I told her I fell asleep [laughter]. I thought she did a really nice job. But I think that we were sort of pleased in many ways by the Honda tournament coming from Fort Lauderdale to here, and Fred Millsaps, who was head of our foundation at the time, when he came to me and asked me: Jack, do you have any ideas what we can do for kids in this area. We have all supported children’s charities, and we don’t know what to do in the Palm Beach area. Of course, that’s when Barbara and I formed our foundation and because of the Honda tournament we did that, and all of the stuff that’s happened with our foundation, it’s happened with the Nicklaus Children’s Hospital in Miami and the outpatient clinics and one in Jupiter opening now has been a result of the Honda tournament. So we have a great feeling towards what Honda has done and what’s happened, and so we’re not only grateful for that, but I hope a lot of kids are going to benefit from what’s happened from that, and look at the support we have, we used to come into the room here at the Honda tournament, and we might have three guys in the press and they would all cover horse racing; not to disparage horse racing. But they weren’t golf fans and it wasn’t that much. So you guys have all helped to make the tournament grow. I don’t know what the charity is going to do this year but they did a little over $2 million last year. JACK NICKLAUS: The tournament’s come around. It’s become a pretty darned good tournament, and I think the players for the most part enjoy it. I think they all could like to win it and it’s your support and Honda’s people have done it, Ken Kennerly’s people have done it and allowed us to be part of the community. Thanks very much.